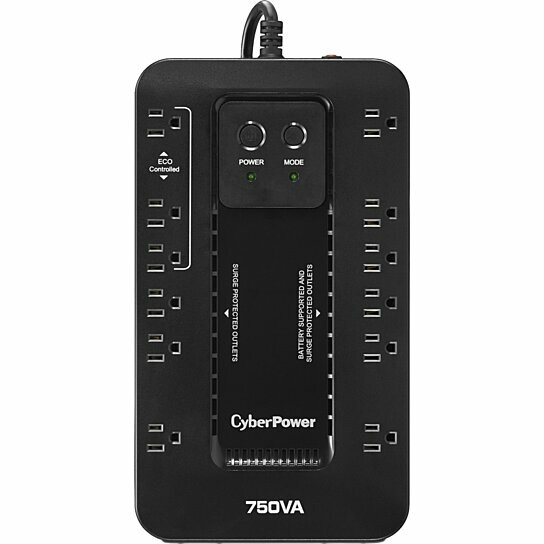 A compact UPS with standby topology, the CyberPower Ecologic EC750G provides battery backup (using simulated sine wave output) and surge protection for desktop computers, workstations, networking devices, and home entertainment systems. During power interruptions, the EC750G offers reliable power protection and battery backup. When the battery backup detects that the computer is off or in sleep mode, computer peripherals connected to the ECO Mode, surge protected outlets will be automatically turned off, reducing power usage and lowering energy costs-USB connection required. The EC750G comes with a three-year warranty (including coverage of batteries) and a ,100,000 Connected Equipment Guarantee.